It is only natural that you have a few wine bottles on your hands and no idea what to do with them besides throwing them away. 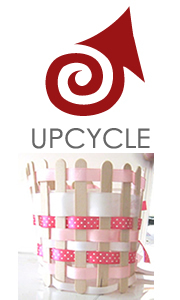 But we, at Upcycle, are all about Upcycling, repurposing all kinds of green sustainable projects. Everything can be used in one way or another and be given an innovative purpose and life in your home, so don’t be in a rush to throw things away. 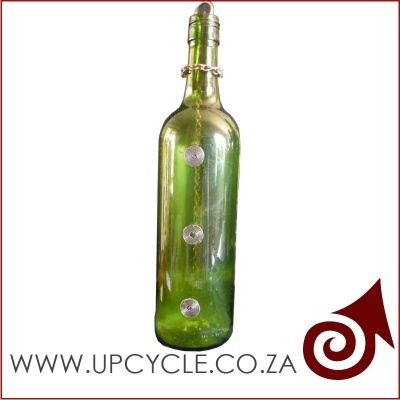 green bottle light fitting on 400Upcycle has always had a passion for glass and all things to do with recycling glass. 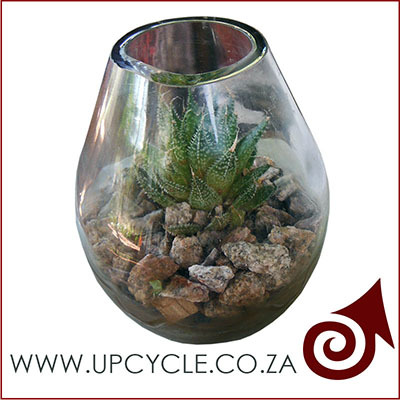 Over the past couple of months, it’s been an absolute delight seeing all the different products that can be created using a simple used wine bottle, a glass jar or glass container. 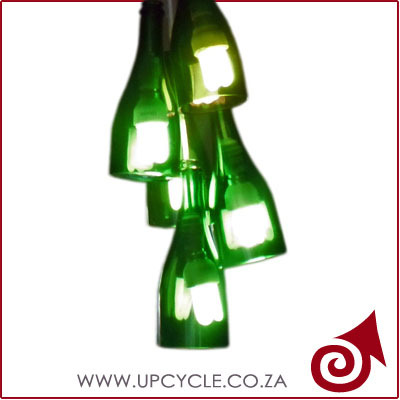 The first and most obvious example is to literally turn your used wine bottles, jars or containers into the most incredible Chandeliers or simple light fittings.The process is easy, a quick cut to remove the base of the wine bottle, add your light fittings and voila. Alternatively lids of jars can be converted to hold the light fitting and a used glass container is transformed into a beautiful light. 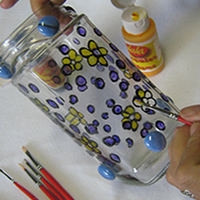 Sandblasting, dremelling or painting your glass light fitting with either glass stain or a ceramic paint, can make your old glass into new art. 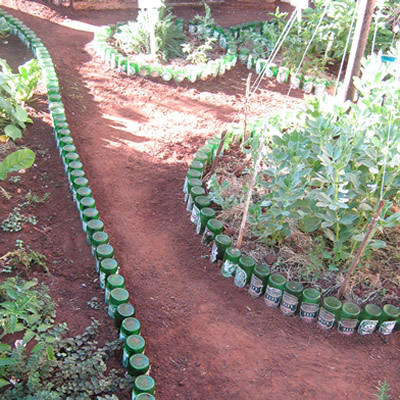 Used beer bottles can be turned into bed trimmings for your herb garden. The bottles create an effective, yet strong and durable border, also giving your flower bed the extra height needed for mulching. Take a look at our idea here: Flowerbed Border with Glass. 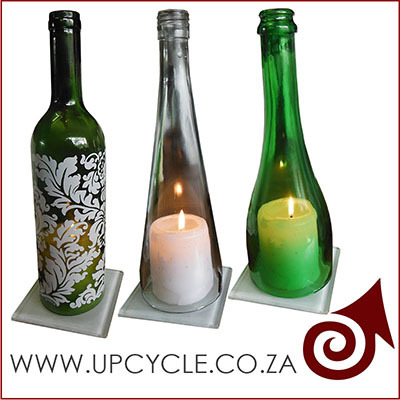 Here we give you some ideas on how to recycle glass bottles. 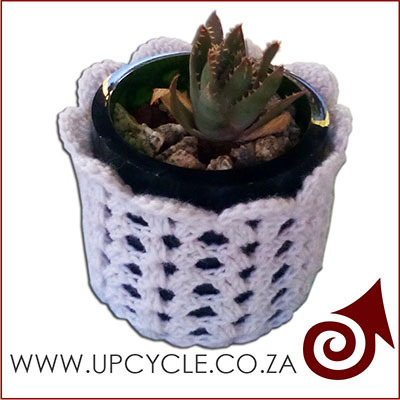 Why throw it away when you can make yourself a beautiful vase, or use it as a flower pot. The thing is that when you make something out of nothing all by yourself, it is the way you feel after you see the result that makes it worthwhile. All it takes is some creativity. So if you wonder what to do in your spare time, try to make something out of glass bottles. It is fun, easy and it won’t cost you anything. Cutting glass might seem difficult and quite terrifying, but the truth is the methods are very easy and are guaranteed to work every time. 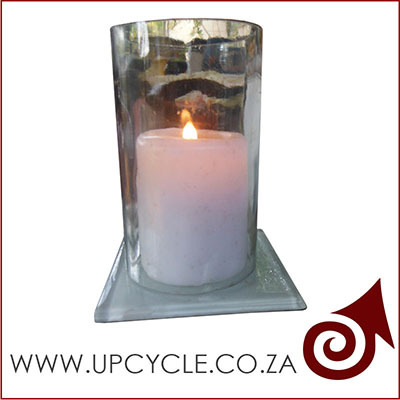 Should you be looking for yet another amazing gift idea, explore our Candle Holders and Tea Light Holders: Candle holders and Tea Lights. For any sandblasting or glass cutting enquiries contact us Visit our product page to see what we have for sale. 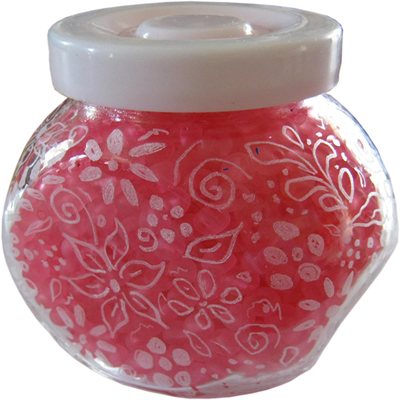 Use a Dremel rotary tool to breathe fresh life into an old glass jar, etching designs and patterns directly onto the recycled glass! Used Nescafe coffee bottles can be recycled into beautiful flower vases. This step by step shows you just how to do it! 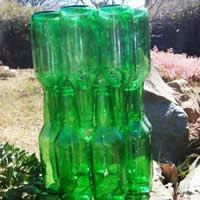 Use all your old beer bottles that you have lying around to make yourself a stunning and environmentally sound candle or lamp shade.  Have you ever had an old bathroom mirror lying around and wondered what you could do with it? 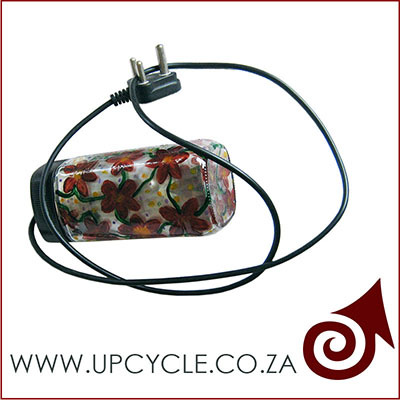 Well, follow our simple step-by-step to turn your trash into a funky mobile! 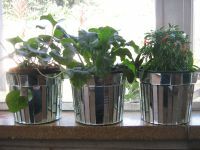 This step-by-step shows you how to recycle mirror and create a classy flower pot with a difference! 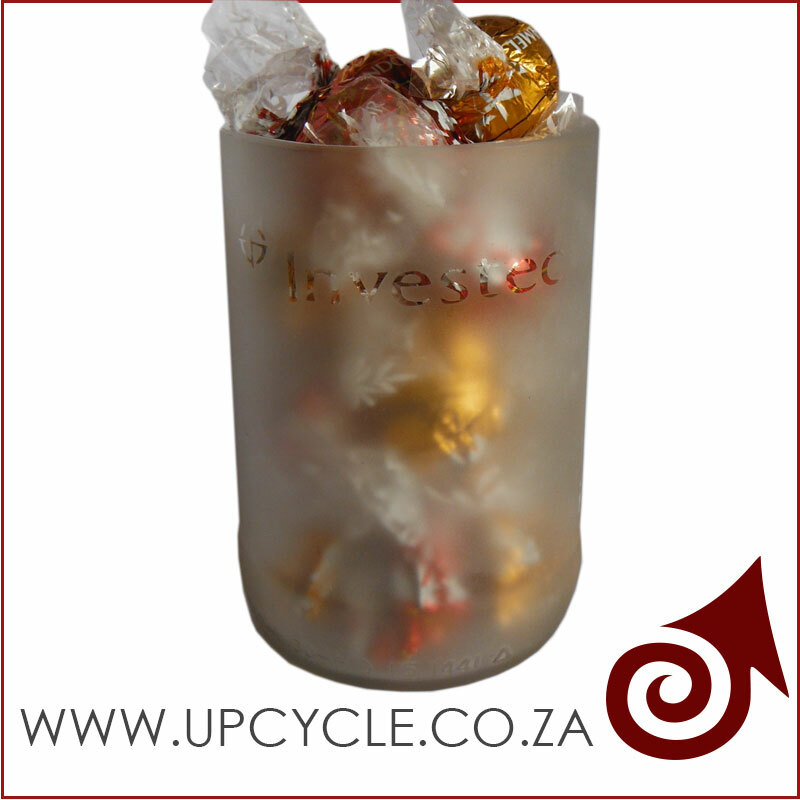 The most common form of glass used in recycling is container glass, namely bottles and jars. Other forms of glass, like Pyrex and window glass, are technically recyclable but can not be mixed as they contain certain other chemicals in their make-up. Many recycling companies will not accept the latter because of the specialized machinery needed and time consumed in the recycling process. To prepare your glass bottles and jars for recycling, first rinse and then place in separate packets to your other waste. Try not to break the glass intentionally. If you are dropping off glass at a recycling plant, check with that specific plant as to whether they prefer the glass broken or intact, and if they prefer the glass separated in different colours. Once the glass reaches the plant, a mechanical processing system breaks it into small pieces called cullet. Metals, labels, plastic, rings and caps are then separated using magnets, screens and vacuum systems. From there, the cullet is mixed with measured amounts of silica sand, soda ash and limestone. The mixture is then placed into a furnace which melts it into molten glass. This molten glass is then poured into moulds and slowly cooled down - the slow cooling process helps strengthen the glass. From there, the new glass containers are packed for resale. 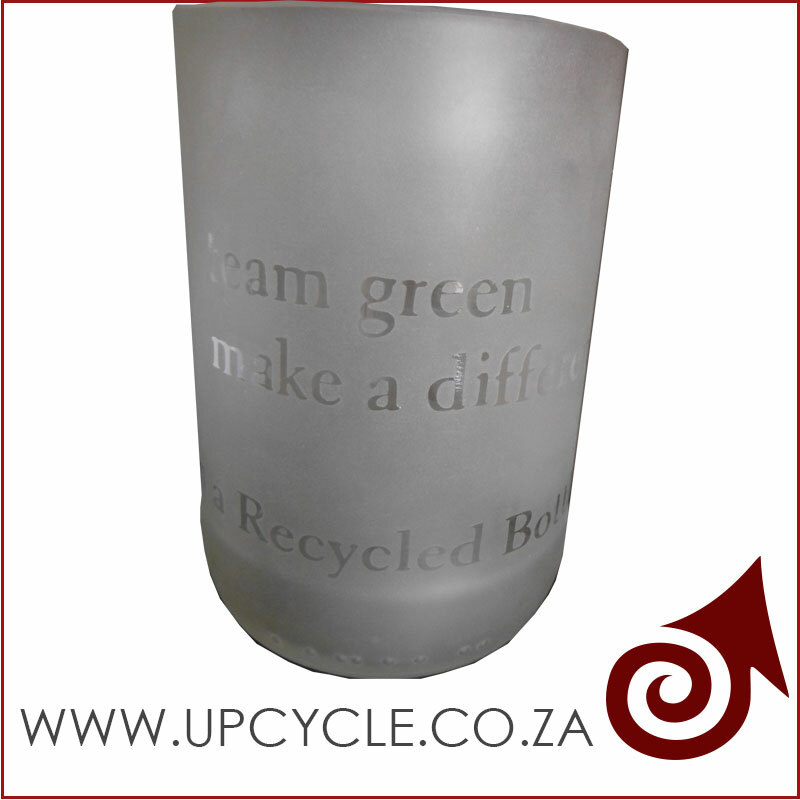 A small amount of recycled glass is also sent to other companies who specialize in manufacturing stained glass. Remember that South Africa, like certain other countries, has a deposit system on certain cool drink bottles, which allows for immediate reuse after thorough washing and decontamination. This is an economical and energy-saving system and affords the person in possession of the bottle a small sum of money when handed in at certain retailers. So, rather than leaving those bottles for recycling, hand them in for immediate reward.